Sari – World Joining Us! Sari is most popular traditional clothes in India. When I came to India first time in 2010, I bought one in Varanasi. But I gave my friend in Ukraine soon because I could not bring it (5M long cloth) next 10 months until I went back to home after one year jouney. This was second time to buy Sari in India. The owner of the shop showed me so many types of design or color. I bought 2 types of Sari, silk and cotton one. I don’t know the average cost but it was Rs 1600 for two. After I went back to room, my younger friends, two girls locked their room and did not show me for over 30 minutes. My another friends knocked the door and asked them to open it but that girls just repeated “No!”. I was wondering what they were doing. After 30 min, they called me and opened the door. Boys were never allowed to enter. Then, they showed me how nice that Sari was. 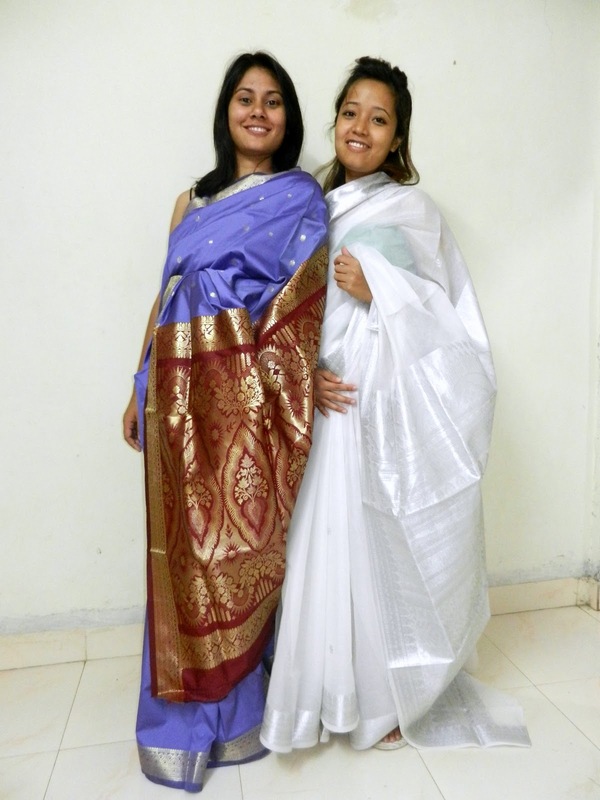 However, it was really taking time until they completed to wear Sari. When my colleague made me wear red Sari for Diwali event at office, she also took time. I thought it was similar situation with wearing Kimono for us. We know the way to wear but we have to try and try again to wear more beautiful and look good. My another friend form Darjeeling told me the white color Sari is only for widow. I remembered some people prayed for a woman who wore white Sari in Darjeeling. After I got back to my work, I asked my colleague if young girl should not wear white Sari or not. But she taught me less people is following this tradition and women who is not widow also can wear it just as fashion. Just 5M long cloth can be changed such a beautiful clothes. The person who made Sari first time must be genius. Sari is symbol how India is complicated and beautiful.